"Defensive Posture (With A Knife)"
The theme at Moody Monday this week is defensive. A lucky break for me since, as often happens during the creative process, sometimes things appear that aren't really there. 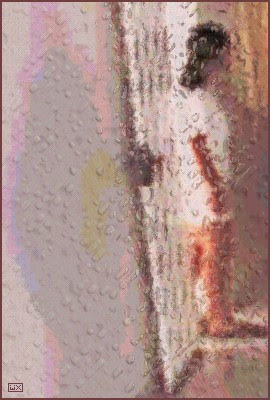 In this case, the filtering process reveals what seems to be a knife in the hands of the young woman standing in the doorway. Hmmm, a good story here - if only I had the strength to create it; but, it's been a long day and I'm in serious need of some mindless entertainment. TV? Yeah! That's it, that's the ticket!